For awhile, it seemed like we were bombarded with photos of beautiful accordion-like potatoes, often referred to as Hasselback Potatoes, in honor of the Swedish restaurant The Hasselbacken, which created them. Tonight, I thought I would give them a try, as the accompaniment to a rack of lamb. I used small Yukon Gold potatoes, but any kind will do. Peel the potatoes. (confession: I didn’t.) 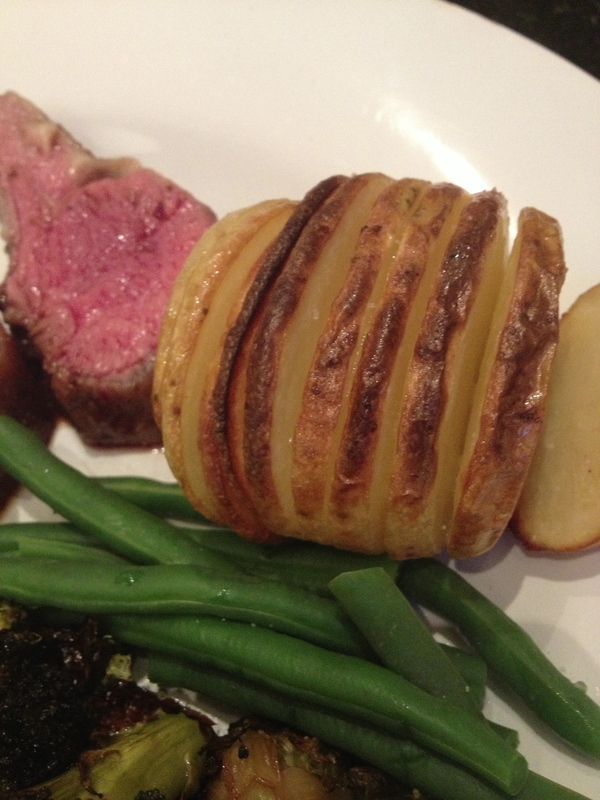 Cut small slits into the potato, leaving it still attached at the bottom. 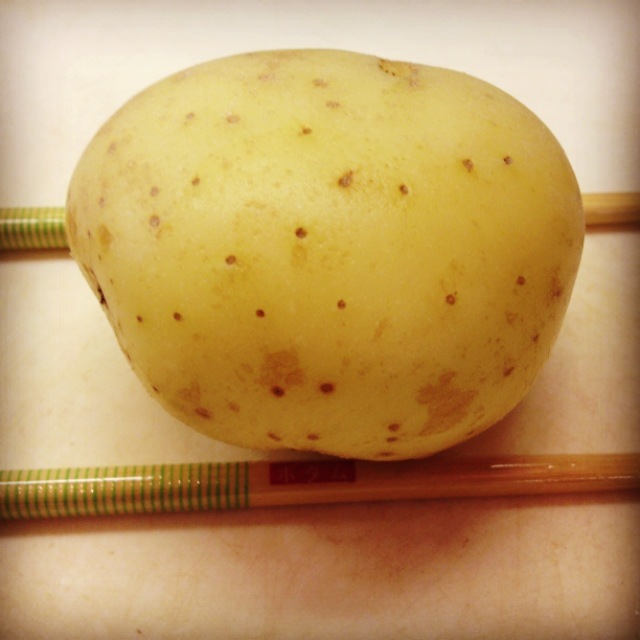 You can place chopsticks on the cutting board on both sides of the potato to stop the blade of the knife from going all the way through. Be sure to cut deeply enough, or the potato will not fan open while baking. 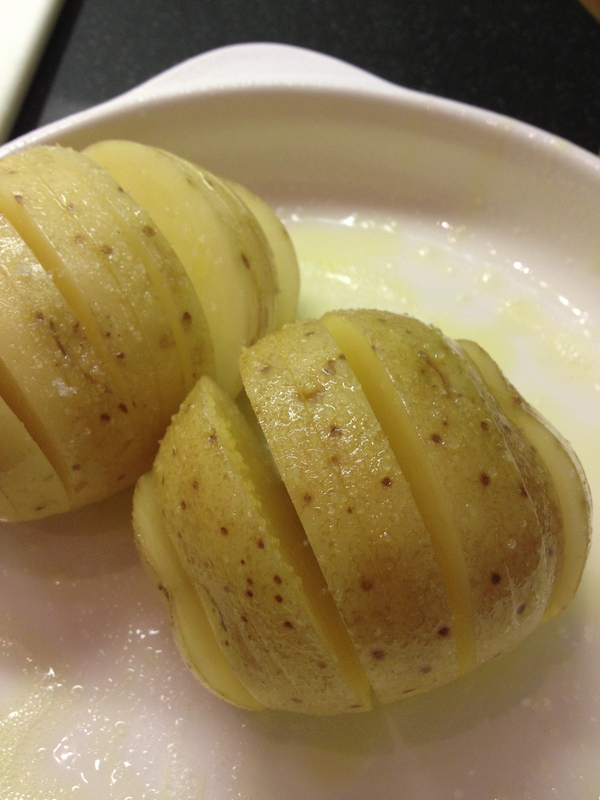 Brush the potato liberally with melted butter or olive oil, allowing it to seep between the cut. Sprinkle it with coarse salt and any other seasonings you wish to use. Place the potatoes in a greased pan, cover with foil and bake in a hot, 400 degree oven for about 30 minutes, depending on the size of the potatoes. Uncover, and brush with more butter or oil, and cook another 15-20 minutes until they are golden brown. Enjoy! 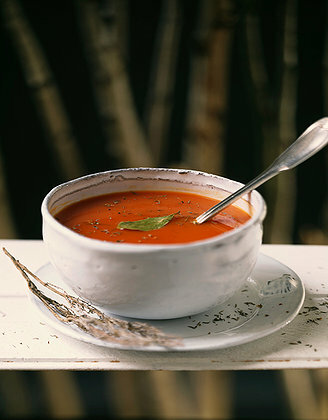 Some recipes call for cheese, garlic, or any other topping that catches your fancy. If you are using cheese, add it to the last 15 minutes of roasting. Just when you think it can’t get any worse, someone comes up with something that tops it all. 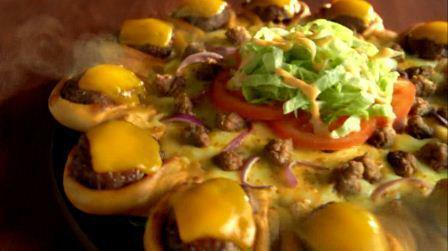 Pizza Hut, reeling from its successful hot dog crust pizza, has released a cheeseburger crust pizza in the Middle East. Dubbed the “Crown Crust Cheeseburger Pizza”, this delicacy has mini burgers set into the crust along the perimeter of the pizza, topped with melted cheese. The center of the pizza is filled with more ground beef, lettuce and tomatoes, and drizzled with “special sauce”. Are you salivating yet? Sorry, it is only offered for a limited period of time in their Middle Eastern locations. Good thing we just wrote about natural stomach remedies, huh? 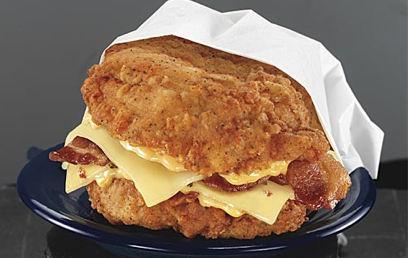 KFC introduced it’s new Double Down sandwich this week, featuring a bacon and cheese filling placed between 2 pieces of fried chicken instead of a bun. This sandwich packs 1228 calories, 81 grams of fat and 317 mgs of cholesterol! The average 145 pound woman ( who is considerably larger than I am) only needs about 1200 calories PER DAY to merely exist. At my size, I would need to take a spinning class for over 240 minutes (more than 4 hours) to atone for that sinful indulgence. Tags:bacon, cheese, Double Down sandwich, fried chicken, KFC, what it takes to burn 1228 calories.